Penn Mac is what everyone calls this place. While I was in the Strip Districtat the Polish Deli, procuring Pierogies for Polish Christmas Eve, I walked down Penn Avenue. This crowd caught my eye. Shot through the glass with a cell phone as I opted to leave the camera home while I ran last minute errands around town. All their cheese is excellent. Waiting for the predicted snow. Not quite a burrow but definitely staying close to home. It’s probably going to impact Thanksgiving travel plans for many in this neck of the woods. I’m avoiding all stores with crowds- as everyone rushes to get milk and the last roll of T.P. There’s urgent hype on the car radio as I drove home from school and I hear from a friend that reports on TV are insistent. 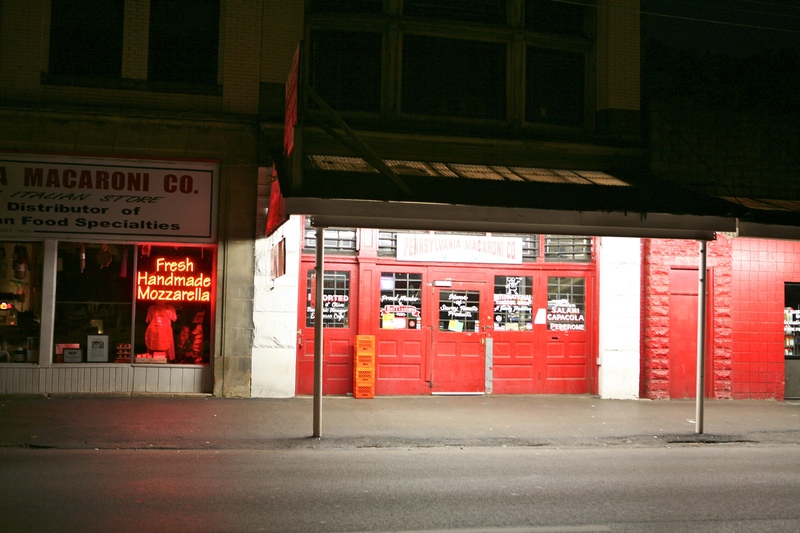 So I went to the Bryant Street Market to get a pound of coffee beans and spied Donatelli’s Mushroom Ravioli in the freezer. Came home and baked the dozen in some vodka sauce from the pantry (don’t ask) for 45 minutes and pretty soon there was a meal worthy of a winter night that feels like February instead of November. In the dining room. What made the meal though? The grater was in service again tonight. 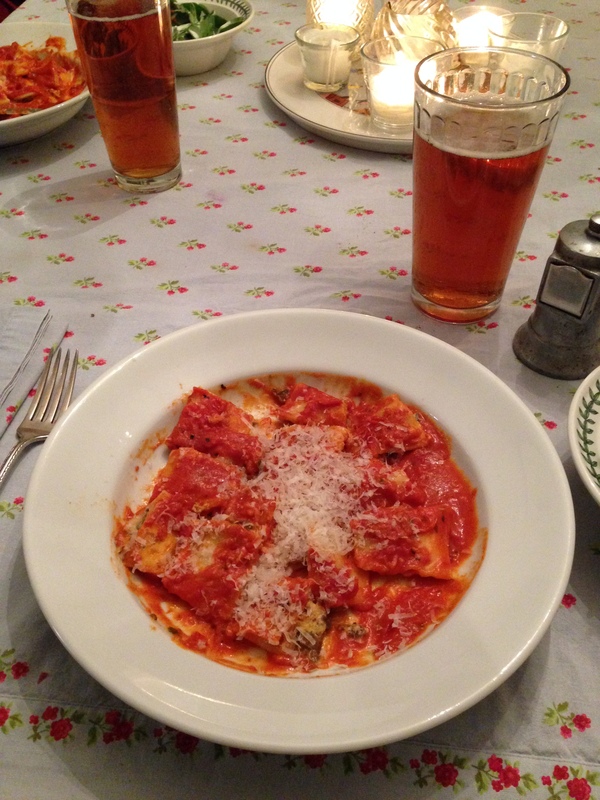 This time for the Parmigiano- Reggiano cheese. Steve added the beer and we had spinach salad. The candles made it seem warmer. Anna and I were on FaceTime Wednesday evening and she asked me what I was going to blog tonight. I didn’t have a plan, I said. She said to tell her when I was posting it so she could be the FIRST one to see it. So I am choosing a summertime August afternoon from their recent visit. Before school started. Storybook Forest in Idlewild Park. Ligonier PA. 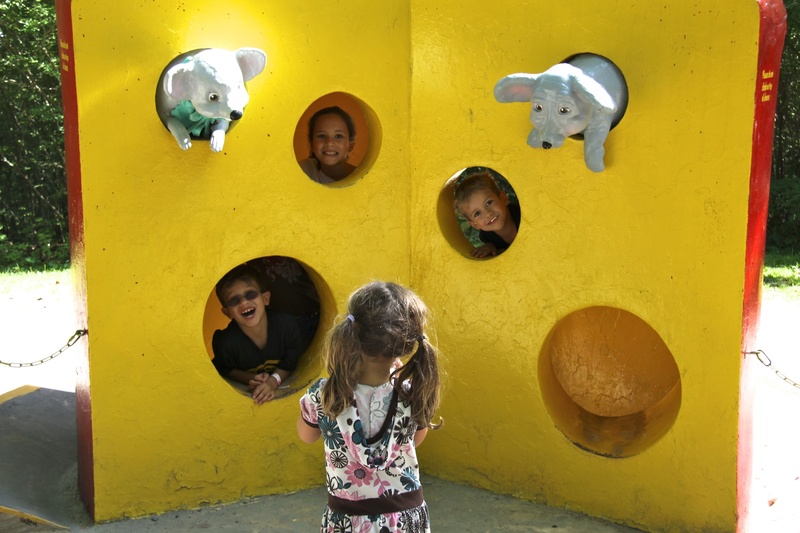 The grandkids in the cheese. Well, three of them that is. 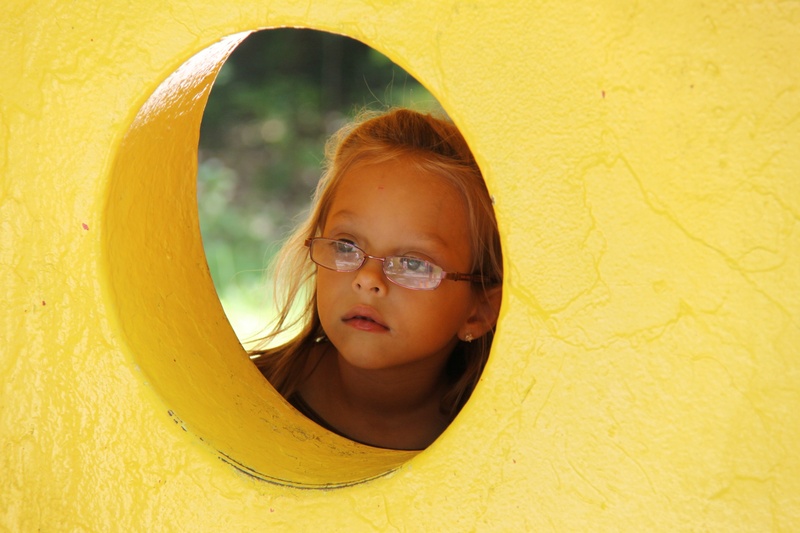 The fourth, Maura was looking at her siblings peeking out of the holes. 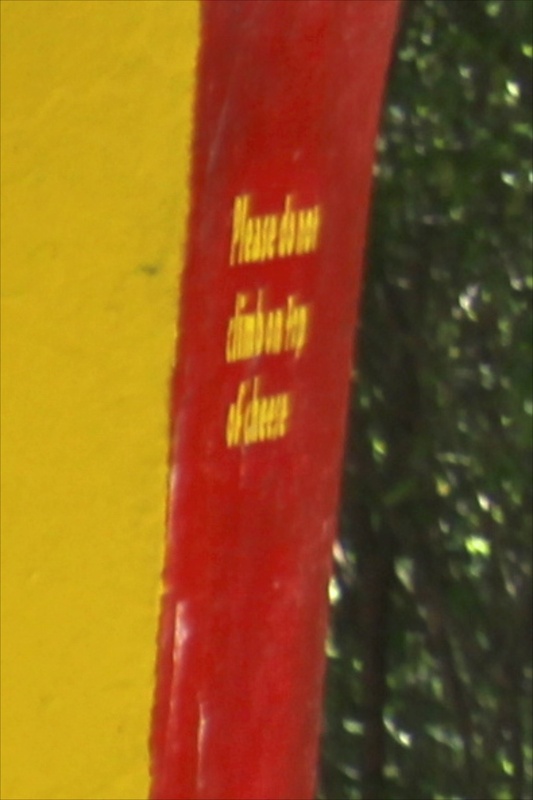 And then tonight as I uploaded, I saw the sign on the side which I had not seen before. Stunk like what?, I asked. The only problem is that they are resting in my DIL’s fridge in Ohio and I am back in Pittsburgh. The temperature going down to nine and I am thinking SOUP! I just got a kick out of the label from their market. Soup BONES? I had never heard the rinds called soup bones and it struck me funny. I use a rind in my minestrone and it really adds to the body of the soup flavor. Any be any soup will do. Shot last week -Spring Break in NYC. My sister walked us by and it was open. They couldn’t be nicer. People behind counters are captive. I ask for permission after a bit of conversation. Sometimes you get “I’d rather not.” but here I got a “Sure!”. 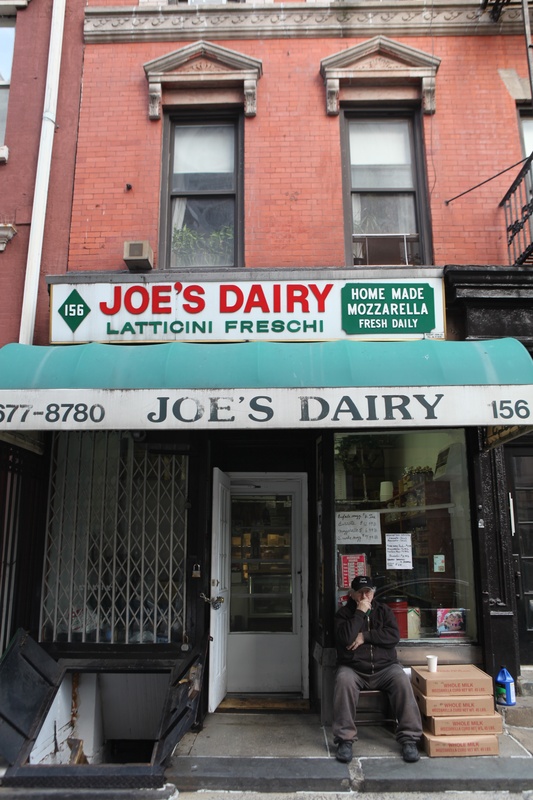 If you want to read more about Joe’s Dairy on Sullivan Street click here. Everyone talks about their smoked mozzarella! Meet Rose Pianoforte. I know, her apron says Angela. She was really nice and helpful. And gracious to allow me to photograph her. Those are olives stuffed with cheese on the counter. We love our Steelers, win or lose. Here’s some Pittsburgh cheese to acknowledge your win, Packers fans and dear friends! (Rob you were right.) I made Haluski, Pierogies and Kielbasa but no one felt like eating here. Have to post now and get to bed cause I’m driving back to the Burgh for school in the morning, YIKES! We had a fun time together but watching the superbowl was so stressful. Kids dropped off to sleep one by one. What we teach our children. 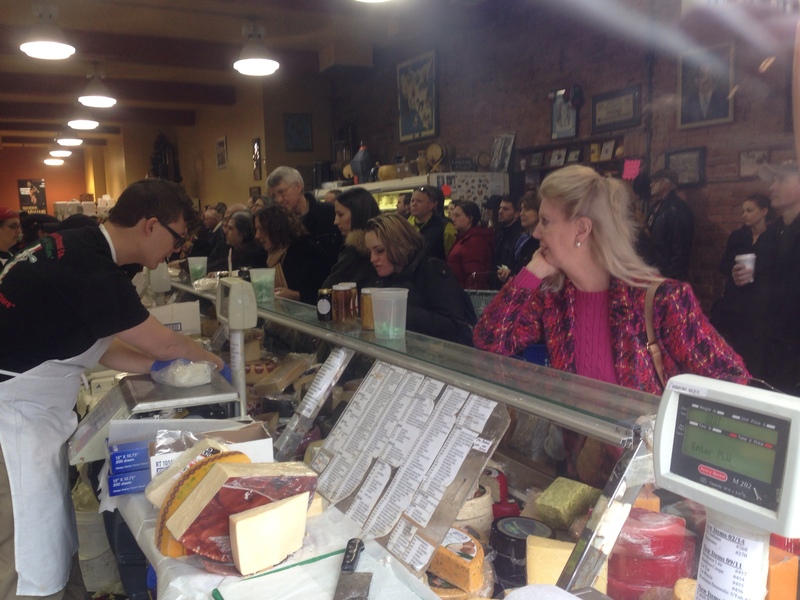 Penn Mac Company on Penn Avenue in the Strip District has some GREAT cheese! !